Klituscope Films is a video production company based in Easthampton, Massachusetts. We produce, film, and edit videos for a variety of uses, including documentaries, marketing, training, live streaming, product demos, fundraising and advancement, speaking engagements, and meetings. 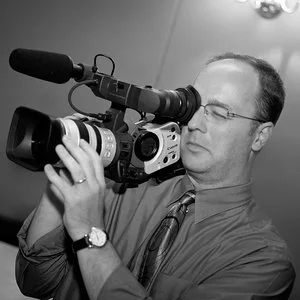 Tom Klitus, the owner of Klituscope Films, has hands-on experience in all aspects of video production: camerawork, audio, graphic design, lighting, directing, and editing. He worked as an apprentice and as an expert in each of these areas before putting them all together as the owner of Klituscope. Tom also trains other video professionals in these areas. Some of our recent clients include the Urban Institute, Solid Fraction Measurement Systems, Williston Northampton School, Smith College, and the Mind and Life Institute. Some of Tom’s highlights include directing a CINE Golden Eagle award-winning video (including Spanish and Mandarin Chinese dialogue!) and directing a 23-hour oral history with retired Supreme Court Justice Harold Blackmun. In 2002, Tom moved to Western Massachusetts, where he started Klituscope Films. A promotional video we produced for the Easthampton (MA) public library won a PR Award from the Massachusetts Library Association. Many thanks to guitarist John Sheehan for his generous donation of music for the soundtrack. Tom is a big fan of Canon cameras and lenses, currently shooting with a Canon XF300A high definition video camera. For editing, Tom has been a longtime Final Cut Pro user, currently editing with FCPX.